Tales of a summer with a 91 (now 95!) year old: Tweetie tweets! Well, the bird has spoken. I suppose his frequent tweets mean that his little birdie self is getting more comfortable in the house. 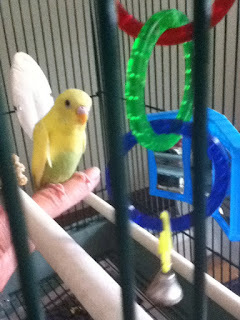 His training is coming pretty well - I was working with him/her (won't know until he's/she's older) and he/she will now comfortably get his birdy-self "up" onto my finger without drawing blood - a big success. That's Tweetie on my finger in his cage yesterday. I, being me, of course rushed his beginning training and brought him out of his cage where he proceeded to flop to the floor and take off running under the sofa. I haven't seen Mom laugh as much in a while - I had to crawl around trying to recapture Tweetie - I'd get close and he'd take off to another spot. Took me about 5 minutes to corral the little sucker and put him back in his cage. The funniest part, I suppose, was my issuing commands I use for the dog such as "STOP", "WAIT", "STAY!" Definitely not effective on a bird - at least, at the moment. John's down to the boat for 3 nights. Lucky man. He's heading out tonight and will return Sunday morning when he'll meet me over on Kent Island for some jet skiing. Carina and Leandro will join us for the day - looking very forward to it. Ron and Linda dropped by last night and brought some great soup. Linda makes the best gazpacho ever - Mom proclaimed it was better than even the gazpacho she loves at Legal Seafoods - that's quite the compliment! Linda also brought over a great tomato soup with orzo and some delicious pesto. Nice evening. 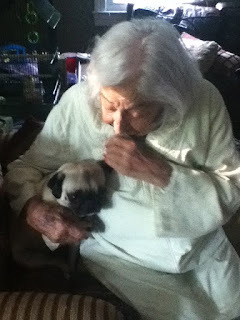 Mom's mind continues to clear - it's fascinating to me how much her personality has come back. She's more like Mom these days as she joins in conversations, cracks dirty jokes, and has the occasional cocktail. Nice to have her back, for as long as it lasts. These are great days. Love reading your tales, which now include feathers. Tweet!